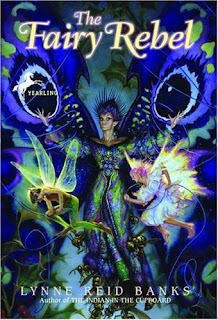 The Fairy Rebel, by Lynne Reid Banks, was sitting on the shelf at the library when I stopped by to pick up some books for my classroom last week. I was familiar with LRB because I had read her book, The Indian in the Cupboard, many years ago, so I brought this home to read hoping that it would be something I could read aloud to my second graders. It’s actually written more for intermediate readers, and after reading it I thought it would be perfect for fourth or fifth graders. I was immediately captured by this pink-haired, blue jeans-wearing, kindhearted rebel fairy, Tiki, and her elf friend, Wijic. It was fun to think of the world of faerie being right in your own backyard, and the chance encounter that brought all the characters together happening as Jan was sitting in her own garden. This entry was posted in Challenges, Children's books, Fantasy on March 31, 2009 by Robin. It sounds fun! and I love the cover also. thanks for the review, Robin. I frist read and loved The Indian in the Cupboard as a fifth grader, I iwll have to look out for this. This one sounds like fun and it’s one I hadn’t heard of, so thanks! We always have a demand for fairy books at my library. Love the cover and the story sounds great. Looks really fun. I love the cover. I’m always looking for good reads for kids–thanks! Rhinoa, it is a fun little read and a gem. Kailana, Nymeth and Susan, I love that cover, too! I’m sure you’d like the story. Sarah, I liked this one even better than Indian in the Cupboard. Tinylittlelibrarian, it’s a nice one and I know lots of kids that would enjoy it, too. Booklogged, me, too! and it’s nicely done. Leisha Camden, the cover definitely caught my eye in the library, and the story that goes with it is very enjoyable. Gentle Reader, I wonder how your kids would like it? Have they read the Indian in the Cupboard? In answer to your question, my kids haven’t read The Indian in the Cupboard, though I’ve often heard it praised. I think my middle son would like it, so I’ll have to take it out of the library, perhaps with this book, too! Maybe this is a good one to read with my 9 year old daughter. It sounds like one we would both enjoy. Gentle Reader, I haven’t read the Indian in the Cupboard for many years, and I know there was some controversy about how the Indian was portrayed. But I loved this little fairy book. Shelley, that sounds like a lovely project, sharing that book with your daughter.